The above ad was featured in the back of Readers Digest magazine, as well as other magazines in the 1970s to 1980s and possibly longer. 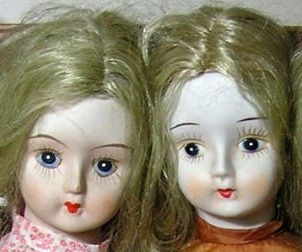 The doll has a cloth body with stitched hips for bending, porcelain fired and painted white shoulder head, stationary glass like eyes, painted upper and lower lashes, cheek blush and rosebud red lips, with porcelain lower arms and legs. She's usually found in a long prairie like cotton dress with bonnet, painted on white socks and black shoes. Where in the world is Walda? 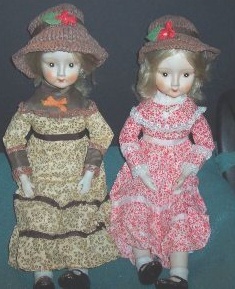 Today she can be found in antique shops, Goodwill, Salvation Army, Mission stores, other Thrift stores, online auctions and doll shops. 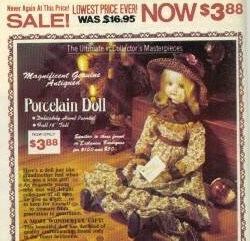 She's everywhere and is usually mis-identified as a genuine antique doll by, everyone, it seems. Thus, she became affectionately known as a "Walda" doll on the eBay doll discussion board, as she turned up so often, all over the place. Yep, many people find one like her in their attic, their grandmother or other family members home, when they are cleaning it out and think "oh what a great antique doll". Perhaps in another 50 years she will be considered an antique, but for now, she's a mass produced porcelain doll, sold in the 1970s to 1980s and possibly longer, whose value today is nominal. Giving her a name is probably the best way to help collectors find her in the huge porcelain doll market.